Good heavens. That Instagram. 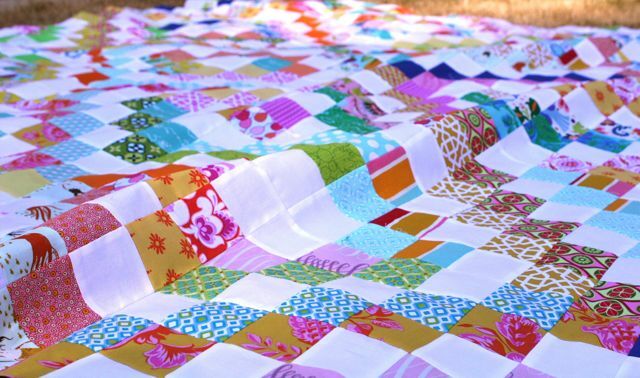 It’s a breeding ground for quilt viruses. And this one was a treasure to suffer through. Thanks to Katy, Rita and Brenda, the #scrappytripalong sprang up between Christmas and New Year’s, and within three days of watching everyone’s photos roll past, I was sunk. 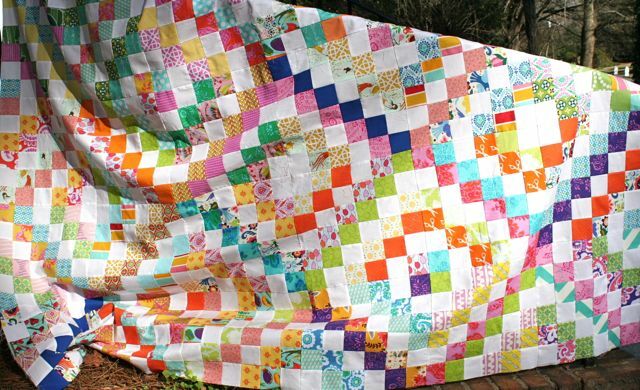 I’m may be a sucker, but I’m a sucker with a hot little quilt, y’all! Rather than go in true scrappy fashion and throw fabrics in willy-nilly (because my particular constitution makes it near impossible for me to shut down my brain long enough to truly avoid editing my selections), I started with a fat quarter bundle of Honey Child and then added in bits and pieces from my scrap bag and my stash in colors that went with those bright and happy hues. Then, for good measure, I threw in a strip of Kona white every third fabric–I almost always choose a solid OTHER than white, but in this case, I thought it would look a bit like Granny squares in a good way, and figured, What’s the worst that can happen? 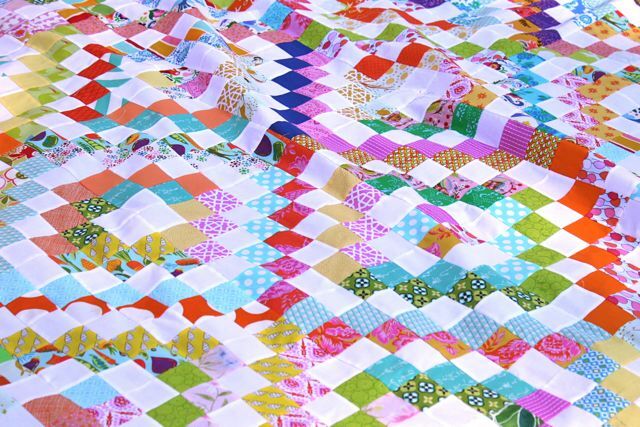 The hash tag folk on IG were all using the Scrappy Trips Around the World tutorial, which is strip-pieced. 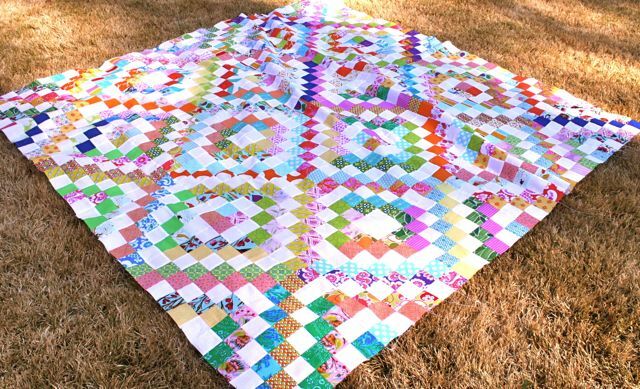 It makes these blocks insanely addictive an quick to stitch up–to the degree that I meant to stop at 30 blocks and do a quilt that measured 60″ x 72″, but FORGOT TO STOP PIECING and ended up with 36 blocks. At 72″ square, this is the largest quilt top I’ve made in a long while–I don’t think I’ve gone over 60″ x 60″ since I made the Chain Reaction quilt for our son. And that was years ago! Here are all the blocks laid out on the living room floor, just before I stitched the final one and plopped it in place. I love the bright cheerfulness of these colors–really looks like me! When all the blocks go together, you can do any number of settings–I like the basic many trips setting, since I think it looks like those God’s Eye things we all made out of yarn at summer camp. Remember those? Can’t you totally see that in the center of each diamond here? I did throw in some darker fabrics here and there, and wonder if I should have avoided that. They certainly stand out, but on the whole, don’t bother me–I just wonder if I would have liked the overall effect more with a more consistent value. Which is why I’ll be doing another in ALL YELLOW. Whipstitch rides again! 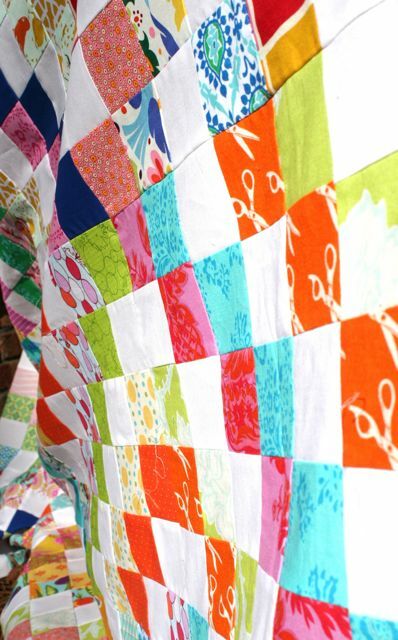 I confess that I used not a single pin anywhere in the making of this quilt top. Some of the seams don’t line up perfectly, but I don’t think any are off by more than 1/8″, if that much. The tutorial tells you to iron all your seams to the side, facing one another, which I did. I know a lot of my Instagram friends chose to press their seam allowances open, but with 1/4″ seams that always burns my fingers, and I love working with locking seams when it comes to putting a block together. Pressing to the side following the tutorial instructions worked really well for me, and the majority of these seams line right up, even without pins. Before I can quilt it, I’ve got my two postage stamp quilts to finish. I’ve GOT to get on those, since we’re making the big out-of-the-crib-into-the-toddler-bed switch in the next six weeks (eek! no more baby in the crib!! 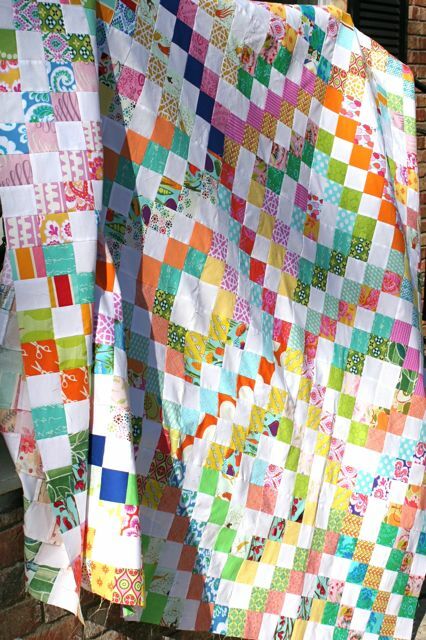 ), and I’d like to have matching quilts for the girls when we do that. 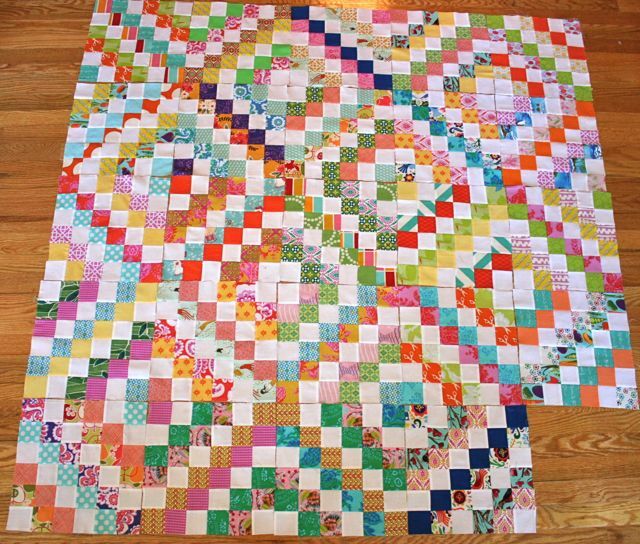 But once those are finished, and my thread order arrives, I am so on quilting this–hopefully by Valentine’s Day or so? At which point I can make the yellow one. Oooh, I think I’ll call that one the Yellow Wonder. Just planning ahead. 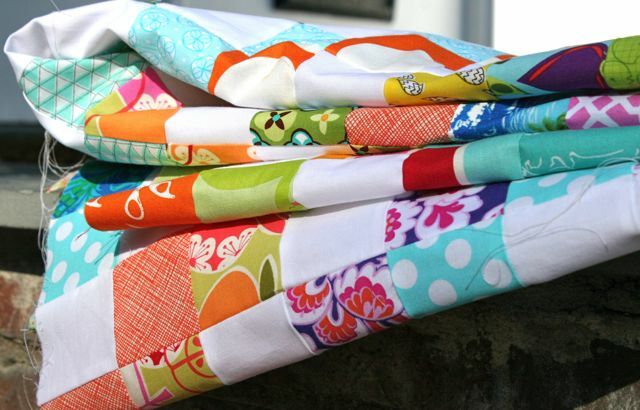 ← Sewing Buddies OPEN for 2013! Totally knew u were going to do this! Love it!